Anastrozole, sold under the brand name Arimidex among others, is a medication used in addition to other treatments for breast cancer. Specifically it is used for hormone receptor-positive breast cancer. It has also been used to prevent breast cancer in those at high risk. It is taken by mouth. Common side effects include hot flushes, altered mood, joint pain, and nausea. Severe side effects include an increased risk of heart disease and osteoporosis. Use during pregnancy is known to harm the baby. Anastrozole is in the aromatase-inhibiting family of medications. It works by blocking the creation of estrogen. 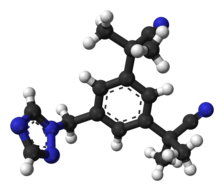 Anastrozole was patented in 1987 and approved for medical use in 1995. It is on the World Health Organization's List of Essential Medicines, the most effective and safe medicines needed in a health system. Anastrozole is available as a generic medication. The wholesale cost in the developing world is about US$1.92–30.60 a month. In the United States the wholesale cost is about $3.81 per month. In 2016 it was the 224th most prescribed medication in the United States with more than 2 million prescriptions. Anastrozole works by reversibly binding to the aromatase enzyme, and through competitive inhibition blocks the conversion of androgens to estrogens in peripheral (extragonadal) tissues. The ATAC trial was of localized breast cancer and women received either anastrozole, tamoxifen, or both for five years, followed by five years of follow-up. After more than 5 years the group that received anastrozole had better results than the tamoxifen group. The trial suggested that anastrozole is the preferred medical therapy for postmenopausal women with localized estrogen receptor (ER) positive breast cancer. ^ a b c d e f g h i j k "Anastrozole". The American Society of Health-System Pharmacists. Archived from the original on 21 December 2016. Retrieved 8 December 2016. ^ Mauras N, Bishop K, Merinbaum D, Emeribe U, Agbo F, Lowe E (August 2009). "Pharmacokinetics and pharmacodynamics of anastrozole in pubertal boys with recent-onset gynecomastia". J. Clin. Endocrinol. Metab. 94 (8): 2975–8. doi:10.1210/jc.2008-2527. PMID 19470631. ^ "anastrozole". Chemical Entities of Biological Interest (ChEBI). European Molecular Biology Laboratory. Archived from the original on 2011-09-22. Retrieved 2011-08-14. ^ Fischer, Janos; Ganellin, C. Robin (2006). Analogue-based Drug Discovery. John Wiley & Sons. p. 516. ISBN 9783527607495. Archived from the original on 2016-12-20. ^ "Anastrozole". International Drug Price Indicator Guide. Retrieved 8 December 2016. ^ "NADAC as of 2016-12-07 | Data.Medicaid.gov". Centers for Medicare and Medicaid Services. Archived from the original on 21 December 2016. Retrieved 18 December 2016. ^ Simpson ER (September 2003). "Sources of estrogen and their importance". J. Steroid Biochem. Mol. Biol. 86 (3–5): 225–30. doi:10.1016/S0960-0760(03)00360-1. PMID 14623515.